The Department of Defense (DoD) and Department of Homeland Security carry out a variety of activities in the ocean waters of the Mid-Atlantic region. The Navy uses the airspace, sea surface, sub-surface, and seafloor of the outer continental shelf for activities such as equipment testing and training exercises (SSR 2015). The Air Force conducts flight training and systems testing over extensive areas offshore (SSR 2015). Marine Corps training extends from offshore waters onto the shoreline and inland (SSR 2015). The outer continental shelf provides unique training and range capability resources critical to DoD testing, training, and operations. Overall, DoD activities in at-sea training ranges have remained steady over the past 10 years (SSR 2015). The Mid-Atlantic hosts the world’s largest naval base (Norfolk, Virginia), as well as numerous other military installations and training grounds. The Hampton Roads area of Virginia is home to one of the largest concentration of military bases and facilities of any metropolitan area in the world. Among them are Langley Air Force Base and the Allied Command Transformation, which is the only major military command of the North Atlantic Treaty Organization on U.S. soil. Operationally, 71 ships were home ported and 38 aircraft squadrons were based in Hampton Roads in 2012. Nearby on Chincoteague Island, Virginia, NASA operates the Wallops Island Flight Facility for civilian and strategic space programs. 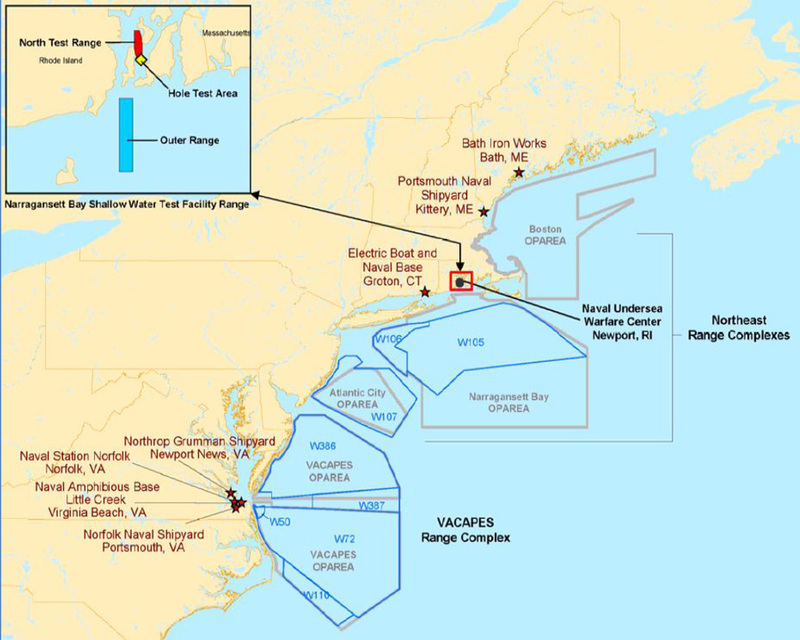 The Mid-Atlantic Ocean Data Portal provides maps of Department of Defense Danger Zones and Restricted Areas, showing where the Atlantic Fleet routinely conducts training exercises and system qualification tests via ships and aircraft. These areas are more common on the continental shelf south of Delaware. The Mid-Atlantic Ocean Data Portal also includes a layer for location of unexploded ordnances; most are located in very deep water, off the continental shelf. The Navy is developing improved data that characterizes compatibility of human uses with military operational areas. The Navy contributes funding for research on marine life distribution and abundance, and it coordinates with NOAA Fisheries on science-based protective and mitigation measures to protect marine species while accommodating military readiness activities. The Navy engages in early coordination with the renewable energy industry to ensure that the planning and siting phases of project development are efficient.